Congratulations to the The Unitarian Universalist Church of Boulder, Colorado, for being the newest UUA Breakthrough Congregation! Each year the UUA’s Congregational Life Office recognizes a handful of congregations that have “broken through” barriers to achieve exemplary goals. The Unitarian Universalist Church of Boulder is highlighted in the fall edition of the UUWorld, which will be hitting Unitarian Universalist members’ mailboxes at any moment. The following study guide is intended to accompany the article about the Boulder congregation. We hope that this enables lively discussions for your congregational leaders. 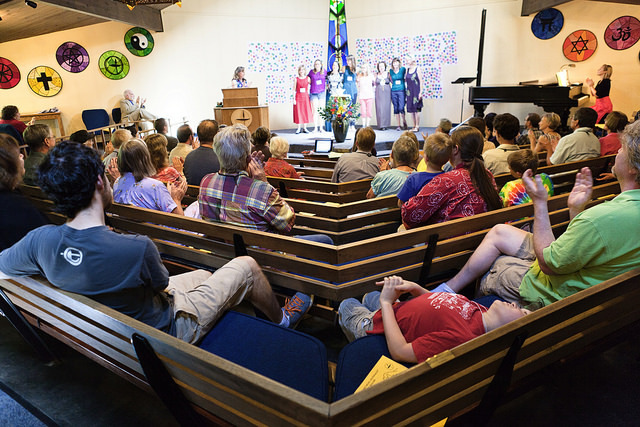 Five years ago, the UU Church of Boulder, Colorado was in dire straits. What were some of the challenges faced by the membership? What challenges is your congregation currently facing? How do they compare to the challenges faced by the Boulder congregation? Among the improvements made at Boulder was a commitment to “radical hospitality” and the targeting of a demographic group, in their case young adults. What is your congregation’s commitment to “radical hospitality”? Who are the demographic groups that you should be targeting? With specific reference to young adults, what practices could you be engaged in to better attract and retain this group? The key to Boulder’s success has been a commitment to “stay at the table” rather than giving up and by being open to change and experimentation. In what ways has Boulder demonstrated its willingness to change and experiment? How committed are the members of your congregation to “staying at the table”? How responsive is your congregation to changing those aspects of congregational life that are holding you back? What will it take for members to be more responsive to change? For the Boulder congregation, the UUA’s Developmental Ministry program was the right answer to address their problems. Is your congregation a good candidate for a Developmental Minister? If yes, how would your congregation benefit from such a relationship? Please note that you can see all the Breakthrough Congregations here. Some have videos, some have study guides. You can also search by size to find examples that fit your congregation. What to know more about Developmental Ministry? This program matches congregations with significant challenges and targeted goals with ministers to solve specific institutional problems. Crave more pictures from the story? There is a photo gallery for the story! You can also view or download the print version from UU World Digital.